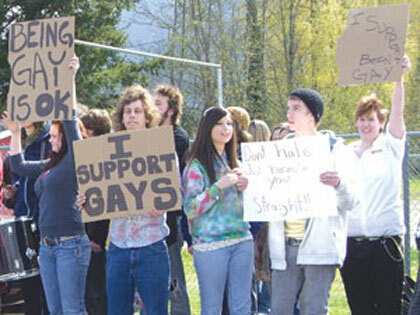 On April 20, 2012, schools across America will allow participants in the Day of Silence to bombard the rest of the student body with an unsettling idea; stand up for homosexuality or share the guilt. And what is this guilt they want the entire student body to bear? They believe that every time a homosexual, lesbian, bisexual, or transgender student commits suicide or uses drugs or alcohol, that it is the fault of a gay hating population. Of course, they neglect to mention that these LGBT youths are mentally unstable in the first place. Rather than setting these kids free from a burden of abominable sin, the adult perps in the LGBT movement are using children and teens as pawns to legitimize their own behavior and to win legal protections for themselves. It is important that the Day of Silence is not ignored. It is a passive aggressive means of bullying Christian students. The United States was founded as a Christian nation and should our nation collapse, the blame will, in part, be attributed to the rise of the sodomite culture, their agenda, and their exploitation of America’s innocent children. What a shame.